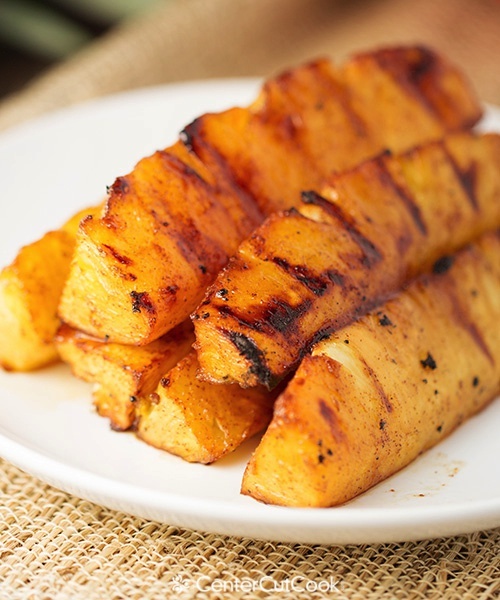 Brown sugar and cinnamon coat spears of pineapple which get grilled to perfection. One of my absolute favorite recipes for grilling season! Food is one of those things that often has a story behind it, or a special memory attached. For instance, when I think of corned beef and cabbage, I automatically start reminiscing about spending St. Patrick’s day with my grandma. When I see a fresh homemade apple pie, I immediately think about the one my mom made and I can picture the sweet aroma it left in the house. When I see a Maggiano’s Italian Restaurant, my first thought is of the first date I had with my husband when we were young high school students. Sooo many foods come with so many memories. Last year my Ryan and I decided to take a road trip. We are NOT what you would call road warriors (I prefer flying), so our trip to Niagara Falls from Chicago was definitely a journey. While we were there, we went to a Brazilian steakhouse that was in our hotel. You know what I’m talking about, right? It’s every carnivores dream! Servers (dressed as Gauchos) walk around and cut fresh slices of all different kinds of meat, table side. Typically it’s all-you-can-eat and you either leave feeling like you just spent an evening in heaven (hubby), or you leave vowing to be a vegetarian for life (me!). I had been to a Brazilian steakhouse before, so I knew what to expect because they’re all typically very similar. What stood out at this particular steakhouse, however, was the pineapple — you read that right, not a certain cut of meat, but the pineapple! Towards the end of our meal, I saw one of the servers carrying a whole slab of pineapple and I knew I had to try it. It wasn’t just ordinary pineapple though, it ended up being the best tasting pineapple of my life! After the first bite, I decided I had to find a way to recreate it, so I did. 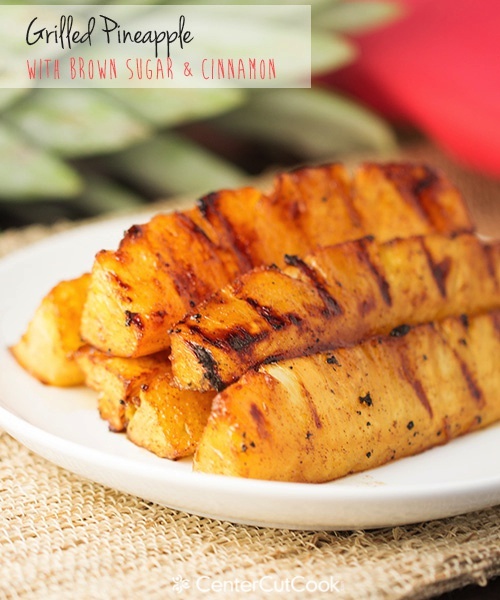 Super-simple, and beyond delicious, this brown sugar and cinnamon glazed grilled pineapple can be eaten as a side dish or served as dessert! I typically serve it as a dessert when I’m making The Best Fajitas. 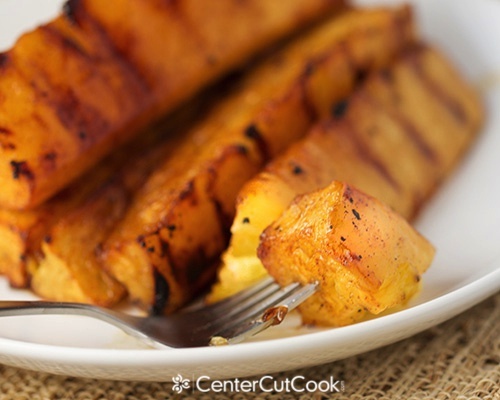 If you’ve never had grilled pineapple before, you must try it! 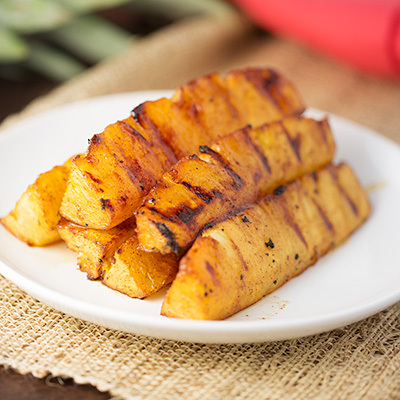 Grilling it changes the flavor completely, so even if you don’t like fresh pineapple, you may like it grilled. It’s sweet, tender, and delicious! As I was saying earlier, food can often times bring back special memories. For me, this recipe for brown sugar and cinnamon glazed pineapple will always bring back the memories that were made during our trip to Niagara Falls, a must see for everyone. Combine brown sugar and cinnamon in a large ziplock bag. Add the pineapple spears, close the bag tightly, and shake it so that the cinnamon and brown sugar coats the spears. Place the pineapple in the refrigerator for at least 30 minutes. Pre-heat your grill to medium heat, around 350-400 degrees. Place the pineapple spears on the grill and turn them every few minutes until all sides are grilled . Grill the pineapple until it is cooked to your liking.